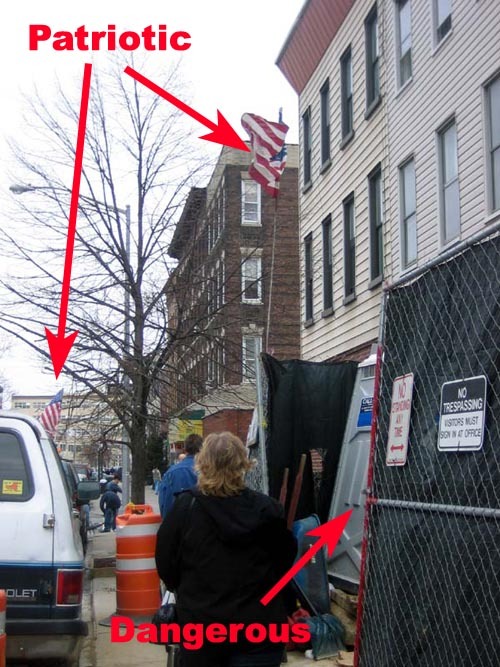 This interesting juxtaposition of images comes to us from our Greenpoint correspondent, who knows a good street scene when she sees one. The interestingly angled Porta-Potty for the adventurous worker that needs to go, no matter what the angle, is located at 164 Norman Avenue, which has been the location of some working condition-related issues in the past. The flags in the frame are a bonus. We don't want to know what will happen if that thing tips over.